Can we geo-engineer our way out of climate change? New technologies may one day pull the greenhouse gases from the atmosphere. But at what cost? With fires, storms, record-breaking temperatures and changes in the natural environment, there is growing evidence that our earth’s systems are becoming increasingly unstable. This has potentially catastrophic consequences. Public debate often places climate risks in the context of "this century" or "by 2100". But scientists are increasingly highlighting the risks of devastating and irreversible impacts in just 20 or 30 years. This is within our lifetimes, and certainly within our children’s. Warming of the planet, caused by the greenhouse effect, is the primary stressor of many of these environmental challenges. Carbon dioxide and other pollutants present further complications, such as increasing ocean acidification. Humans have long affected their environment. But until we started burning fossil fuels in the mid-1800s, the amount of carbon we added to the air balanced the amount removed. However, over the past 150 years, CO2 emissions have far outpaced the subtractions. Our annual production of carbon is currently around 40 billion tonnes. Scientists debate how much carbon can be safely stored in our atmosphere before exceeding safe operating limits. The United Nation’s Intergovernmental Panel on Climate Change (IPCC) estimates it to be around 300 billion tonnes, but many scientists suggest a much lower amount. 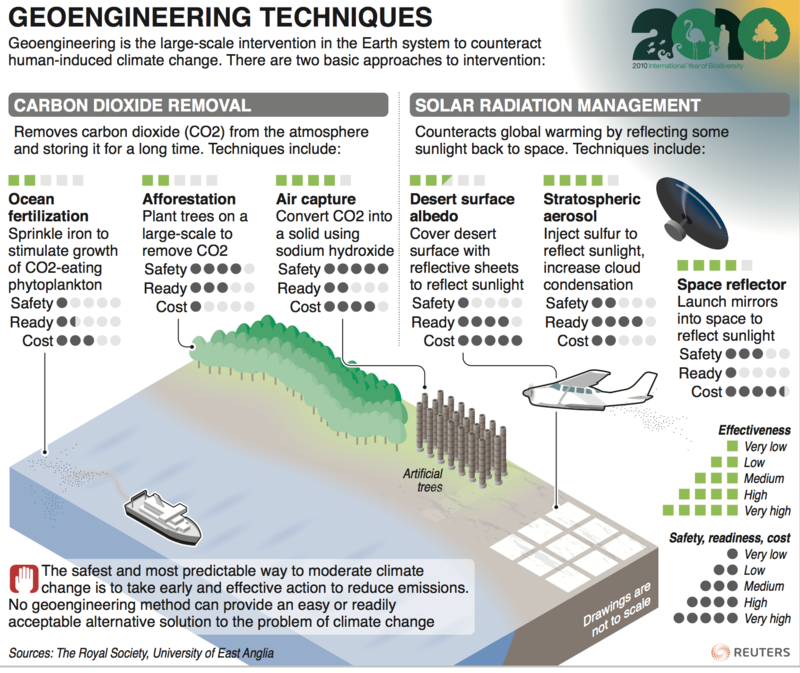 Will geoengineering end the debate over climate change? Climate scientists believe that a CO2 concentration of 450 parts per million is likely to warm the climate by 2°C, the safe upper limit. By 2015, CO2 in the atmosphere rose to 400 parts per million. At our current rate of emissions, we will reach 450 ppm within 20 years. Even if we achieve the Paris Agreement reductions in greenhouse gas emissions, the gases that were generated over the past few decades will be absorbed back into the earth slowly, and will be at an elevated level in our atmosphere for hundreds, if not thousands, of years. 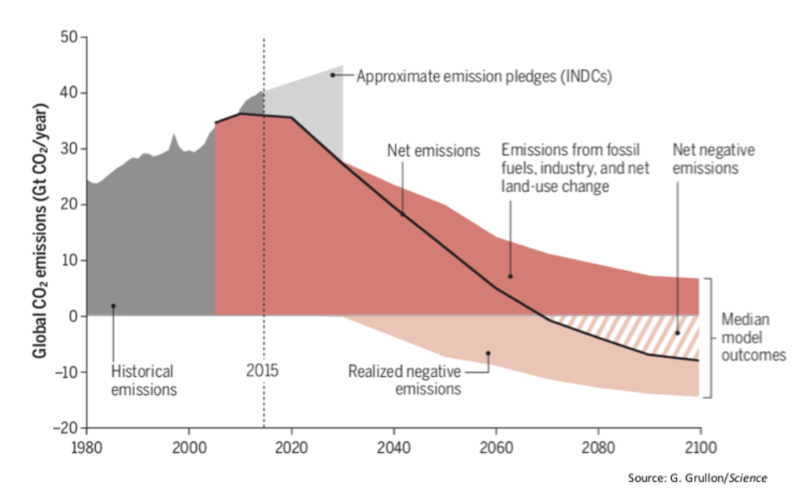 To stay below the safe threshold of 2°C, the UN and IPCC plans entail removal of CO2 from the atmosphere using methods that do not exist yet (“negative emissions”). Some countries are developing plans for adapting to a warmer, more volatile planet. However, the cost of adaptation starts to rise rapidly as climate-linked incidents become more common. The Paris Agreement and bold decisions by certain nations to expand renewable energy, introduce electric vehicles and deliver on the Sustainable Development Goals are powerful multilateral steps to mitigate the impact of climate change. Adaptation to a warmer climate may not be a realistic long-term proposition for certain nations such as small island states and low-lying countries, given rising sea levels. We would still suffer the ecological loss of disappearing sensitive ecosystems, such as coral reefs. During the agricultural, industrial and digital revolutions of the past 150 years, we have arguably been accidentally engineering the Earth’s system. We lit the planet where it was dark. We transplanted species, paved forests, emitted carbon, moved rivers and changed the Earth’s chemistry. Could we now apply the advances of the Fourth Industrial Revolution to protect the natural systems we rely on? In recent decades, scientists have proposed engineered interventions to counter the effects of climate change. These are called "climate interventions" or "geoengineering". They are not long-term solutions, but could protect communities and ecosystems, buying time both to reduce emissions and for the climate to cool. 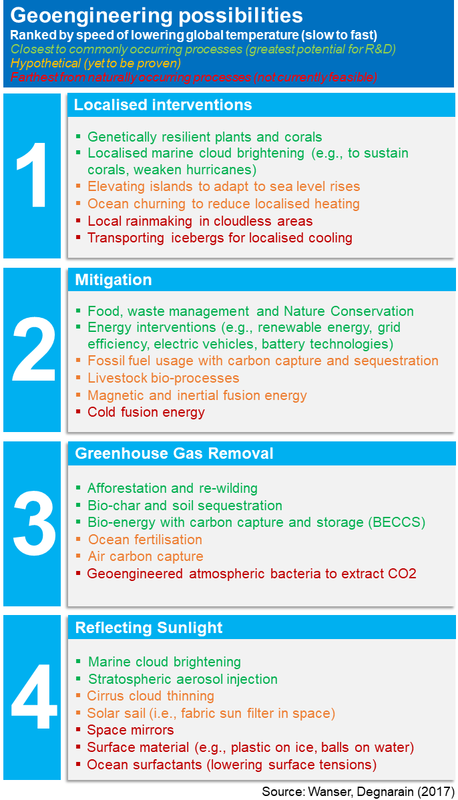 Such technologies fall into three categories: removing greenhouse gases from the atmosphere, reducing heat by reflecting sunlight, and intervening locally for a specific problem or system. Greenhouse gas removal, or “negative emissions technology”, uses industrial air filters or even living organisms to capture greenhouse gases and convert them into energy or materials, or store them in the ground. Many of these exist only as proof-of-concepts, and will take decades to deploy at scale. Therefore they could only reduce the heating effect slowly over time. “The only known means of reducing warming in a timespan of years-to-decades is to reflect additional sunlight away from Earth,” states leading climate researcher, Ken Caldeira. The most promising means of reflecting sunlight are based on natural processes. They involve dispersing particles to make the stratosphere more reflective, or to brighten clouds. These will take a couple of decades to develop, but if viable, could reduce warming rapidly. Local interventions range from genetically modifying plants and organisms for survival to cooling parts of the ocean to sustain corals or dampen hurricanes. We do not have the means to implement any of these options yet. A global governance effort for geoengineering? Engineering the climate is not without risks, creating great plotlines for Hollywood blockbusters, and making environmental decisions even more complex. Reflecting sunlight could alter regional rainfall patterns. Greenhouse-gas removal methods may harm natural ecosystems. We will need frameworks to assess these risks. Yet as climate threats grow, a wider range of countries, and even other non-state actors, may develop interventions. We will need governance for decisions about when and how these tools might be used, and such decisions must be inclusive. Experiments are safe on a small scale, and people will need to do them. We must ensure that such research is open, that safeguards are in place, and that findings can be verified. Above all, we need options. While many are concerned about controlling geoengineering, these capabilities do not even exist yet, and are very hard to develop. We currently risk having no options at all. It will take a decade of small-scale research and development to assess the feasibility and risks of these approaches, and another decade to scale any option for meaningful use. We will need a new generation of Fourth Industrial Revolution platforms, such as satellites, drones, exascale computing, advances in bio-technology, to analyse the climate as we work to sustain it. At present, we need a sufficient portfolio and pipeline of research and innovation. This ensures that if efforts to reduce emissions are not enough, we have options to protect ourselves, our ecosystems and our society, and leave an inhabitable world to future generations.